All transactions are safe and secure with a reliable history in online purchasing behind each of our associates. Buy the Grumpy Bear Costume t-shirt to own Care Bears clothing and merchandise. When it comes to good old fashion fun, these cloud hopping bears can't get enough, but one of the bears often finds a dark cloud following him. 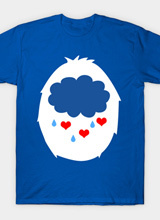 This blue Care Bears shirt features Grumpy Bear's symbol (rain cloud). Share in his misery by grabbing one for yourself and one for your best friend today, whether that's Tenderheart Bear (heart) or someone else. Wear it under an adult Care Bears Halloween costume. For activities to do with friends, play the Care Bears games. In addition to the Grumpy Bear Costume tee above, browse the Care Bears Clothing Gallery for more apparel like men's and women's clothes, kids shirts or hoodies.